So you wanna get strong, huh? You should. Don’t get me wrong, a nice, muscular physique is great, but it doesn’t mean much if you can’t back it up. And while there’s definitely more than one way to build up your strength, today we’re going to talk about one of the most effective methods of doing so – heavy compound lifting. 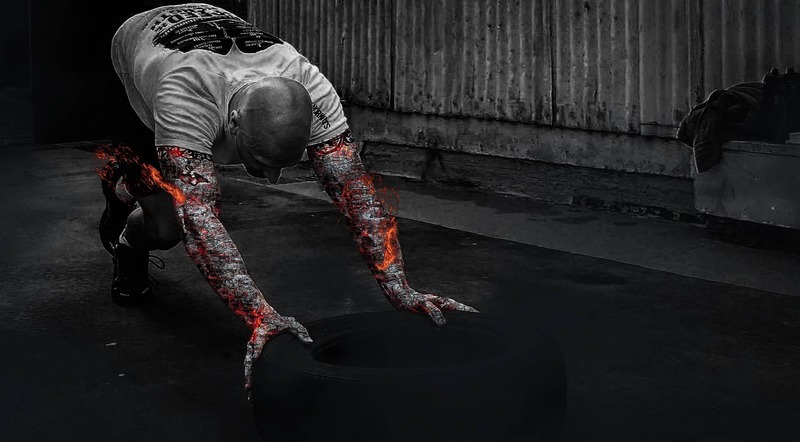 This is a style of training that will build off what you have already learned in our article covering barbell training. The training program that we’ll be covering here will be of the low volume variety – which means you’ll be spending only a few days per week in the gym, and spending the rest of the time recovering. You’ll also be lifting in the low rep range, and you can expect to mainly be doing sets consisting of 5 or 6 repetitions. With that said, just because you won’t be spending a lot of hours in the gym doesn’t mean you won’t work HARD. But if you put the work in, you’ll build an absolute ton of strength, as well as a physique you can be proud of. NOTE- This is not for total beginners, if that is you, you need to start here. You should have some familiarity with weightlifting in general, and compound weightlifting in particular before you start training this way (at a minimum, you should be comfortable with the movements we’ll be outlining, and be able to practice them with good form). While heavy weight lifting certainly isn’t the “end all, be all” of training, working out this way does have serious advantages over training with lighter weights at a higher volume. While the jury is still out on which approach builds more muscle mass, it’s hard to debate the fact that lifting heavy simply builds more strength. Having brute strength not only looks impressive (who doesn’t want to bench three plates? ), but it also carries with it benefits that transfer over into your life outside the gym. Not only will it help out in daily life (pushing your car out of a snowbank, picking up your kids, etc), but strength is also associated with longevity, since the stronger you are, the longer it takes many of the degenerative effects of aging to set in. Now, that’s not to say that high volume and other forms of weight training don’t build strength – they do. They build quite a bit of it. But there’s something that happens when you make getting stronger your primary priority that’s tough to replicate with anything else. One of the downsides of a high volume approach to training is simply the amount of time required to do it effectively. And while some guys love spending five days per week in the gym, for others, that kind of workload simply isn’t appealing or practical. 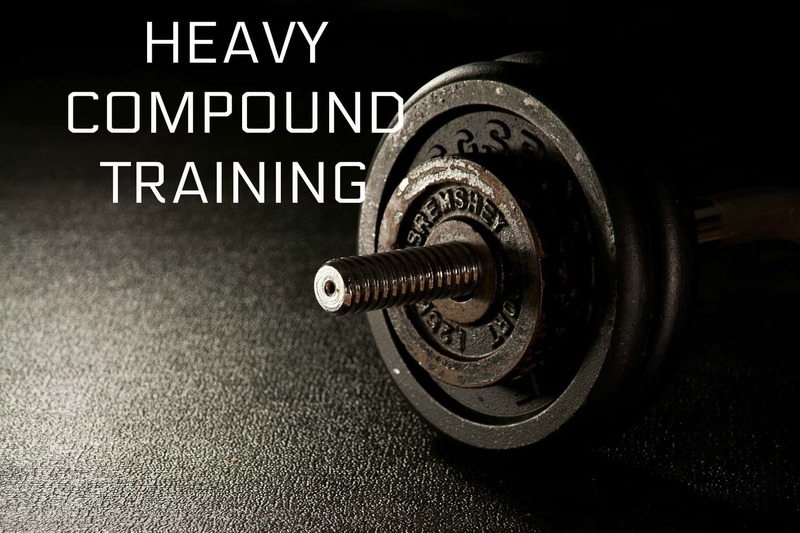 With heavy compound training, you spend less time in the gym by necessity. 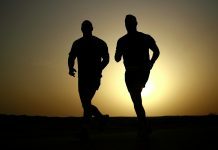 It’s very difficult to do these kinds of workouts and spend more than a few hours per week training due to the taxing nature of the work and the amount of time required for your muscles to recover. You’ve heard this word over and over again throughout this guide – and you’re going to hear it again because it’s that damned important. If you are not completely sure what progressive overload is, it is the steady increase in weight over your workout to increase strength. When it comes to building muscle, progressive overload, or the ability to handle more and more resistance over time, is king, and one of the key factors that drives muscle growth. Heavy compound weightlifting certainly isn’t the only way to hit progressive overload. Any kind of sensible, well-programmed routine will accomplish this. But the fact of the matter is that by combining compound movements with heavy weight, it makes the process of achieving progressive overload simple. After all, there’s nothing quite like throwing more weight on the bar each week to let you know that you’re making progress, am I right? 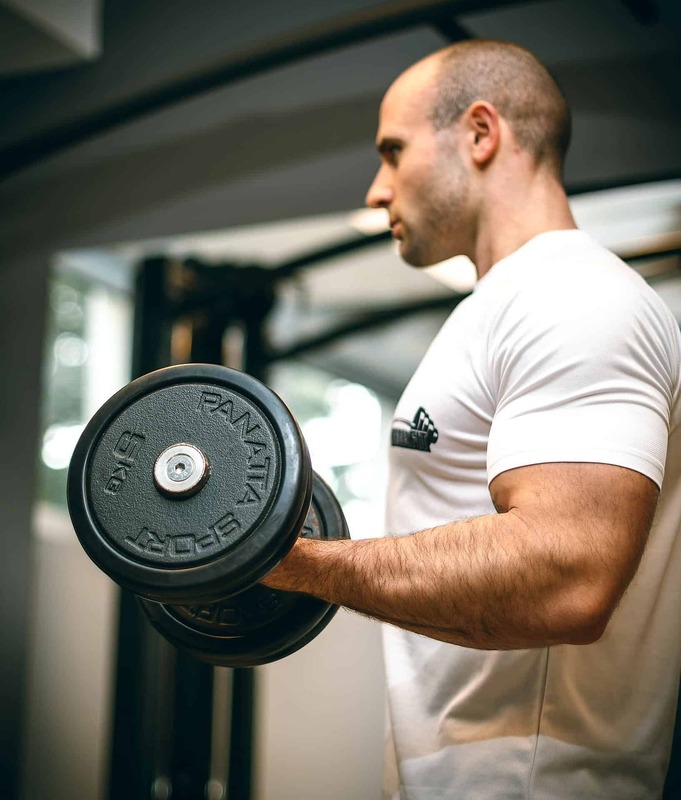 Like we mentioned previously, this will build on what you learned in the section on basic barbell lifts, so if you’re not quite familiar with that yet, make sure you get up to speed before embarking on this program. With that said, while barbell or dumbbell training is suggested for this kind of training, it’s not strictly speaking required. If you have issues with certain barbell movements (lower back injuries, etc), or if you simply choose not to use them, you can substitute machines for most of these movements (we’ll include an alternative for each exercise). Bench pressing is going to be our go-to horizontal pushing movement. It’s an exercise that builds up not only the pecs, but also the shoulders, triceps, back and, to a certain extent, the quads (no, benching is not an excuse to get out of squats, so don’t even try). As our vertical pushing exercise, the overhead press will function mainly as our shoulder builder, but will also hit the tricep, parts of the back, lats, and core (since the overhead press is typically done standing). As a compound hip and thigh movement, as well as an all-around lower-body builder, the squat will play an integral role in developing leg power and strength throughout the posterior chain. It will, as you may have guessed, work every single muscle below the waist, as well as your core and lower back, and to some extent, your upper back. The deadlift is a phenomenal full body exercise and is mainly included to not only develop your pulling strength but to focus on the back and legs as well. It’s a highly complex movement, so make sure you have a firm grasp before you start piling weight on the bar. Added to provide balance to what could be a “push heavy” routine, the barbell row is a phenomenal muscle builder and will add serious mass to your entire back. This is one that’s NOT a barbell exercise but is nonetheless a fantastic compound movement. Chin-ups are great because they not only build pulling power and add mass to the back, but they also build up the biceps as well. The way to make this exercise both heavy and low rep is to use a weight belt with a chain and add plates to it. In our section on compound versus isolation exercises, we talked about the role that each type of movement plays, and why most trainees should use both. And while heavy “compound” training certainly is (obviously) a training style focused on compound movements, it is important that we add a few key isolation movements into the mix as well. The reason we do this (in case you skipped the article) is to prevent imbalances from occurring, and to build up any muscles that are “lagging behind”. Here are a few isolation moves you should consider and the key muscles that they target. While the flat bench is phenomenal for chest development, the upper chest (or the “clavicular head”) tends to get neglected. And since this muscle is responsible for rounding out the pec and giving your chest that nice “plate of armor” look, it’s definitely worth doing some incline work. Yes, weighted chin-ups absolutely will put your biceps on blast. However, unless you’re genetically gifted, most guys find that it isn’t enough, and will benefit from some direct arm work. They may look ridiculous, but they’re great for targeting the glutes, an area that many guys find lags behind the quads when they squat. Calves are stubborn, and unless you have very, very gifted genetics you’ll need to blast them directly – and relentlessly. Now that you understand the basics of compound lifting, let’s crack into a sample workout. The following routine will have you working out three times per week. Most of your main lifts will be done using 5 x 5 (5 sets of 5 repetitions), with assistance lifts using higher reps. Make sure you take plenty of time to rest between sets (3-5 minutes), and make sure you stretch and warm-up before starting each session. And remember, each week you should aim to add either one more rep or a little extra weight to the bar. Of course, you can do your 3-day routine on any 3 days you choose, but I must emphasize again the importance of getting a day of rest in between each workout session. If you really need to get in the gym for 1 or 2 more days every week, just do some cardio or even some light yoga.